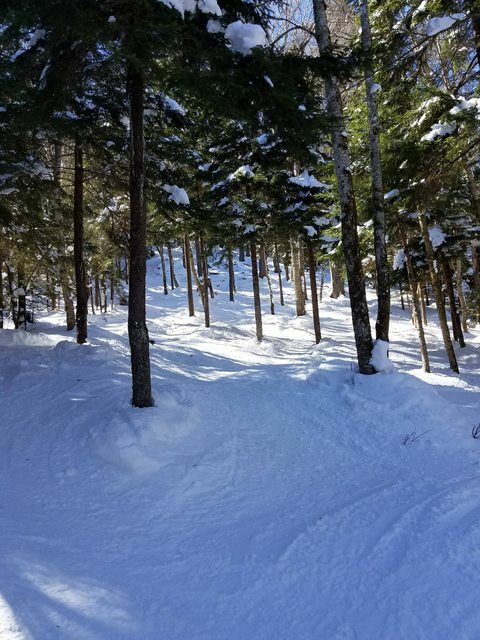 Including Silvercreek with many trails not groomed. Ikonic day! Or just Ridiculous. When was the last time that happened this late in the season? Imagine how great it would be if SS was just a bit closer (2.5-3 hours) so could be done more easily for a day trip? Of course it would be packed beyond belief, but if you could hit it midweek would be great. I’ll be looking for you and Martin near the Sugar Shack webcam around lunch. 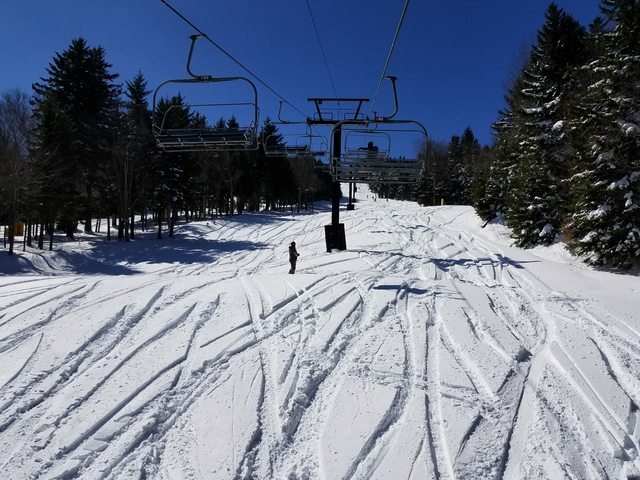 Enjoy first tracks on Bear Claw. OMG. What a trip! I went up last Thursday and was planning on leaving Sunday. I just returned home last night.wore out. Stayed in 4 different places. Best conditons of the year or the past 3 years. Reminded me of March 2013 when we had 8 feet.. Tally was 68”s since Thursday with 7 days of riding. Swoop and I did make it to Silvercreek for rope-drop on Friday. 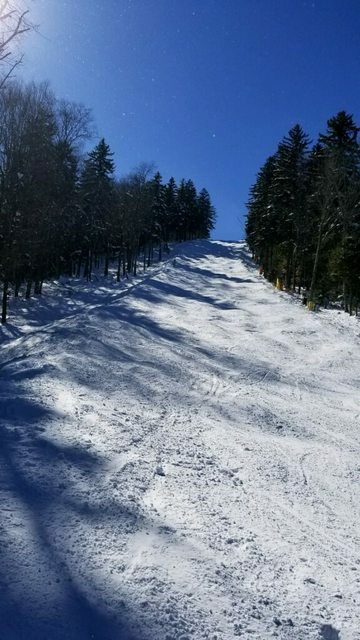 They groomed the center of all trails expect Bear Claw & Flying Eagle. There was about 20 or so waiting at rope-drop when they announced Flying Eagle lift was delayed opening until noon. A little bummed initially however it turned out there was plenty of unracked sides to be played in until then. The snow was something between blower pow and Sierra cement, with a very thin crust on top. Made for an odd ski, my 106s float near the top but the crust made turning seem unnatural. Not bad, just different. The texture was really good once the fresh was tracked up a bit…which seems odd, but true. We broke for lunch early @Sugar Shack to be sure and make the noon opening of Flying Eagle. Once there we had to wait with others for the rope to drop on Laurel Run to get there. After about an 6 runs and some throught the FE Glades, we decided to make it to WT for some afternoon turns. Cupp was meh icy with thin snow on top..one and done. Shays was better. 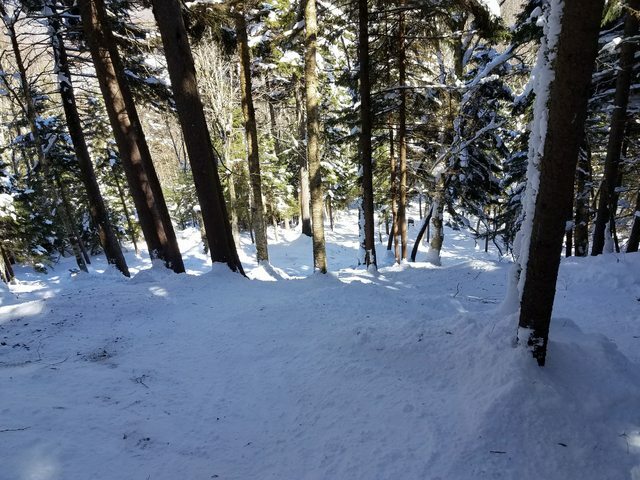 Lower Shays, right, had soft bumps with some icy patches. Lwr Shays, left, was real nice snow. 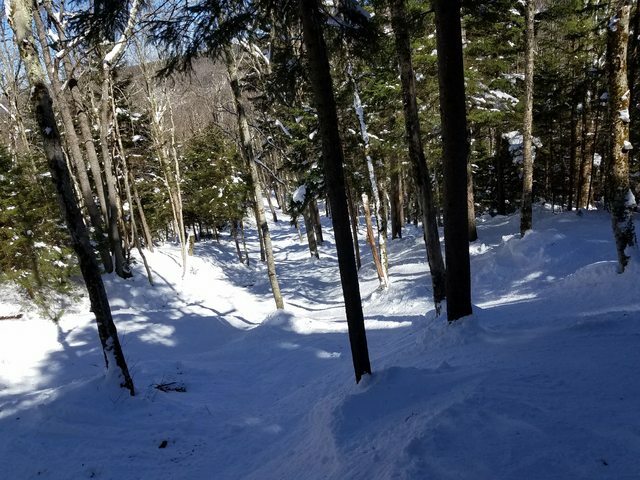 The groomed trails had the best snow texture of the season and the notorious BH lift was 2-5 deep in singles line, so lots of laps were had. Swoop reported Sawmill was great soft bumps but the glades not so good. Thanks for the report. Looks like Wednesday has the chance to be really good or not so good depending on how the precip plays out. Guess I’ll find out. Thursday & Friday look better imo. 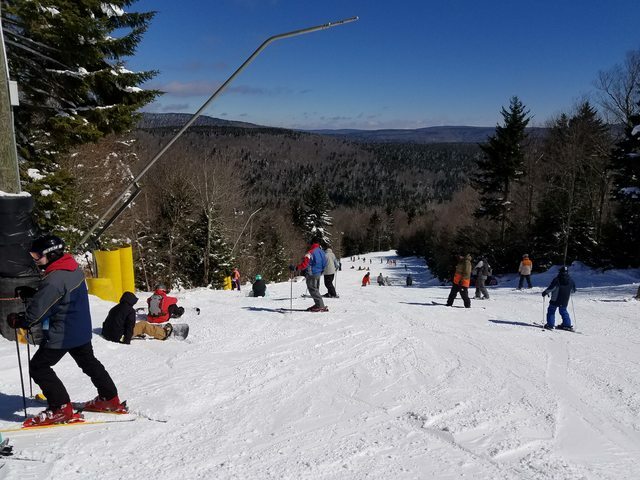 Today (3/21) was a ski anywhere day at SS. I hit some lines I have been wanting to do for years. Getting up to SS today was a challenge - my usual 3 hour drive took 5 hours. But my trusty Subara Forester got me there eventually. About 6 inches of snow fell overnight and probably another couple inches during the day. 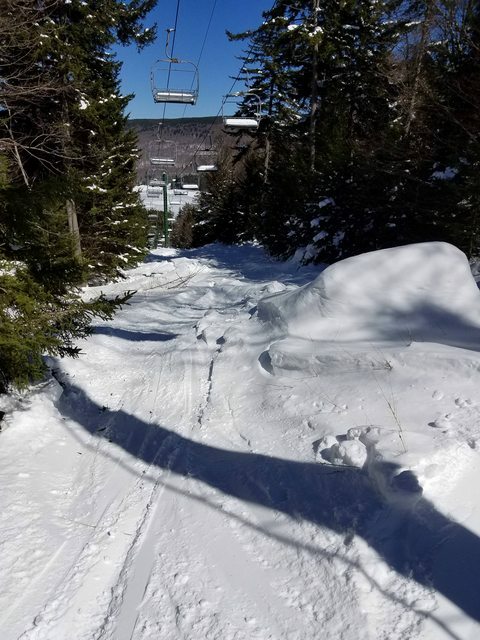 Combined with the snow left over from last week and you could basically ski anywhere, at the cost of a some base scratches. Started at Soaring Eagle and worked my way over to Western and back. Powder turns off to the sides all day. Won’t be able to make it up there this weekend for passholder appreciation day. Hoping to make it up for the fina weekend. 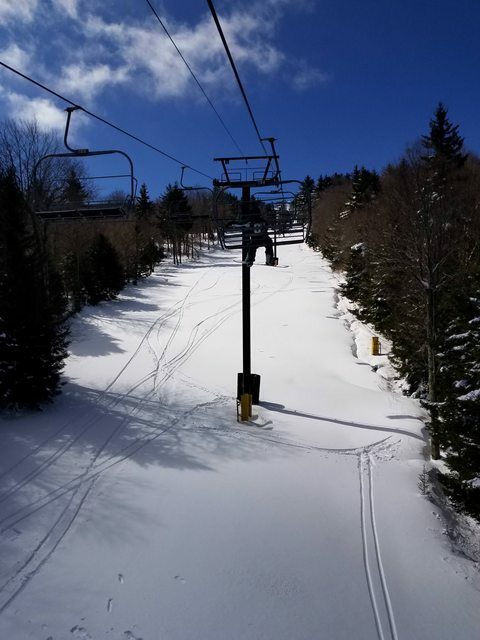 I’m looking to go up for the final weekend, any thoughts on how conditions will hold up this coming week?